Radiant Health cuts through the confusion of conflicting health advice and trendy wellness fads delivering efficient and effective tools for mind and body wellness. Taught by Rachel Avalon, one of L.A.’s most celebrated and trusted health coaches since 2005, this program delivers a wealth of holistic knowledge. If you’re ready to lose weight, get glowing skin, practice more mindfulness, experience natural vitality and focus, as well as lead a more balanced life that shapes a better world then this course is a beautiful match for you. 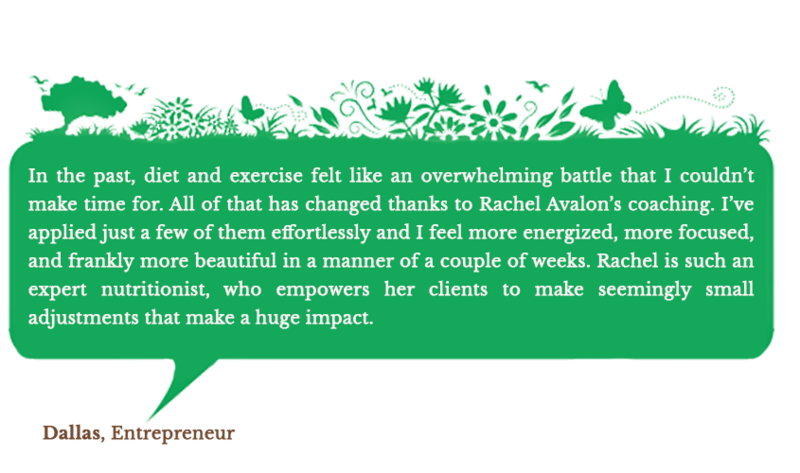 It’s also the perfect introduction to Rachel’s work and is highly recommended before doing The Avalon Cleanse or any of her other programs. This program is about finding simple yet profound ways to let go of unhealthy, sabotaging habits and replace them with transformative strategies that cultivate both short-term and long-term health. It’s about moving past any fear or doubt and claiming a new level of vitality and mindfulness that’s infused with love, positivity, and confidence. Radiant Health covers the foundational, yet enlightening teachings Rachel shares with people from all walks of life including artists, educators, CEOS, major celebrities, healthcare practitioners, and world-class athletes. The Radiant Health online course has a full 30-day satisfaction guarantee. If you find after completing this program, the material wasn’t inspiring or beneficial, ask for your money back and you’ll receive a refund.